Manapōuri hydroelectric power station is New Zealand’s largest. 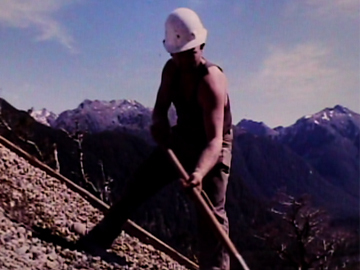 This 1970 NFU film — made for the Electricity Department — follows workers clearing a path for power through epic Fiordland mountains and rainforest, building roads and power pylons, and stringing a cable along the “hard and dirty” 30 miles to the aluminium smelter at Bluff. Sixteen men were killed constructing ‘the line’ before power was first generated in 1969. At the same time the scheme generated mass protests (the ‘Save Manapōuri’ campaign) at the proposal to raise Lake Manapōuri's level.